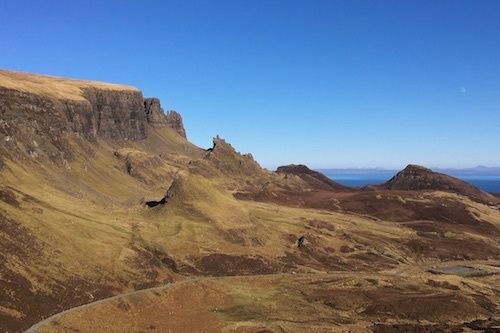 Our most comprehensive one day tour from Inverness taking you through the Scottish Highlands to the Isle of Skye and the Trotternish Peninsula to explore its stunning and dramatic scenery. The Isle of Skye Explorer tour begins at Inverness where we follow the banks of Loch Ness down past Urquhart Castle to Invermoriston before turning west through Glen Moriston on the way to Loch Cluanie and Glen Shiel. Loch Duich awaits us at the foot of the Five Sisters of Kintail mountains with the stunning Eilean Donan Castle in the distance. After a brief photo and refreshment break at the castle we cross the bridge to the Isle of Skye and on to explore the magnificent Cuillin mountain range. 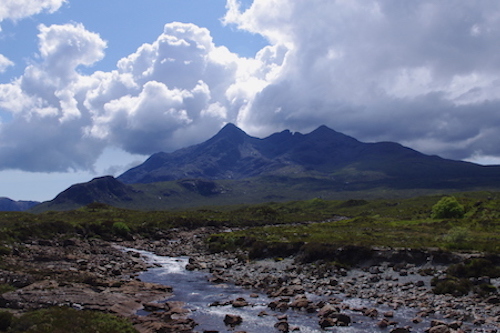 Our journey through the Isle of Skye takes us to the base of the Red Hills and the dramatic Black Cuillin mountain ridge. We stop near the old bridge at Sligachan (great place to take a short walk) where we get the best view of the peaks of the Black Cuillin. Arriving in the beautiful harbour town of Portree we enjoy a late lunch before exploring the Trotternish Peninsula in northern Skye. First stop is for photos of the Old Man of Storr in the distance. 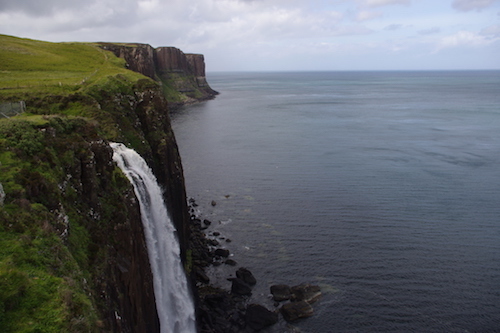 Next is a visit to Kilt Rock for an amazing view out across the Sound of Raasay and beyond before we take a drive up the old cattle pass road to the Quiraing. Looking down on the village of Staffin below and across the sea to the north west Highlands, the Quiraing is one of the highlights of the Isle of Skye tour. After returning back to Portree for a late afternoon coffee stop we then begin our journey back to Inverness. While the tour does cover over 260 miles we do this over 11 hours which allows for lots of stops and time out of the vehicle enjoying the scenery. 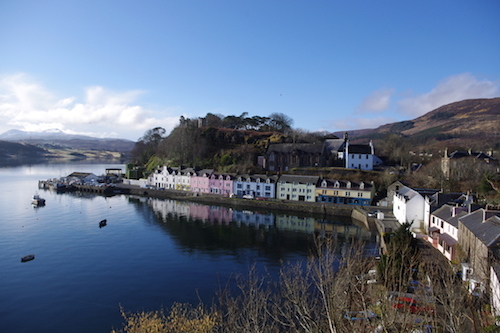 We have a 30 minute refreshment stop in the mid-morning at Eilean Donan Castle, a 1¼ hour lunch stop at Portree, and a 30 minute refreshment stop in the late afternoon back at Portree. Additionally, we have at least 7 viewpoint and photo stops between 10 and 15 mins. Please note that it is quite a long drive to the Trotternish Peninsula but we try and make sure you get as much time as possible out of the vehicle. This tour does not include time for a visit into Eilean Donan Castle (just a photo and refreshment stop) - for a visit inside the castle please consider our Isle of Skye Adventure Tour inc. Eilean Donan Castle. I can promise our tour will include all the wonderful Scottish Highland and Hebridean views shown above... but maybe not the weather - we are the land of four seasons in one day! Tours are exclusively for your private group only (up to 3 persons) and prices are per tour. We only offer private tours and do not combine individuals or separate groups - if your group size is less than 3 the advertised tour price still applies. Prices include all taxes and a driver/guide but exclude meals - there are no entrance fees on the standard tour.